FROM endless encounters with Donald Duck and co to exploring Nemo's Reef and seeing off Captain Hook as fireworks fill the sky, life on board the Disney Dream – which evokes liners of years gone by with its dark blue hull and gold detail – promises to be a full-scale fairy-tale adventure. But just how magical will the experience be if you're setting sail with a baby in tow? 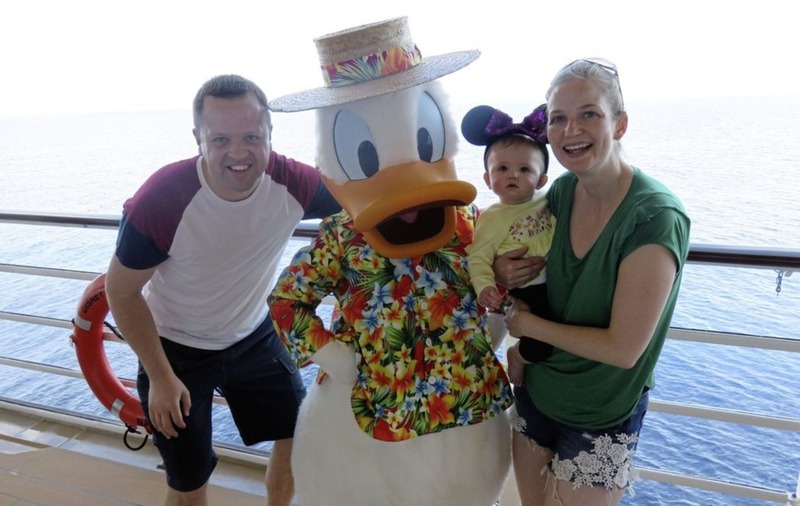 To find out, we embarked on a four-day cruise from Florida's Port Canaveral to the Bahamas – including a stop at Disney's idyllic private island, Castaway Cay – with our 11-month-old daughter, Evie. :: Were you nervous about taking your baby on a cruise? Admittedly, the week before setting off was full of trepidation for me and my wife, Carla. We'd never taken Evie abroad before, so couldn't help worrying about a few things: How would she cope on the nine-and-a-half-hour flight? How would she be on the ship? Would she be OK with the low-30s temperatures we were set to encounter? What about her sleep routine – and how on earth would we prepare her food with no kitchen? But, as soon as we stepped on board, Disney sprinkled its magic and our concerns disappeared. :: What's the ship like? Everywhere you turn, Disney's 'cast' – as all the on-board crew are called – are one step ahead; everything you could possibly think of or wish for has been taken into consideration, even things you didn't realise you might want! It's the little things that make a big difference. In our stateroom, for example, our many suitcases, rucksacks and pushchair all tucked away neatly under the bed, leaving us with plenty of room to get around the cabin. A heavy curtain separated the travel cot from the rest of the room, meaning we could still have the lights on and chat after putting Evie to bed, and the bathroom and shower are separate to the toilet, making getting the family ready that little bit simpler. :: What's so special about a Disney cruise? Whether exploring Walt Disney World or cruising the Bahamas, the highlight of any Disney experience is meeting the characters, and this is easy and convenient on board with plenty of chances each day, meaning there was always a way to see Mickey, Minnie or Donald, regardless of what else we had planned. And, when we bumped into Donald on one of the ship's 14 decks, he was only too happy to stop and pose for photos. :: Is it possible to have time to yourself on a cruise with a baby? At US$9 (about £6.40) an hour, dropping our daughter off at the It's A Small World Nursery – complete with a playroom and separate sleeping quarters with full-size cots – for an hour or two is an affordable treat, enabling us to relax in the adult-only pool bar, soak up some sun, and enjoy the spa. Bliss! The nursery was particularly popular in the evenings too. Along with other parents, we left our sleeping daughter for a couple of hours so we could try out the adults-only Palo restaurant, a modern Italian situated at the stern of the ship and serving up culinary delights including a classic beef tenderloin and a delicious signature chocolate souffle. After a luxurious four-course meal, we finished our wine out on deck under the night sky – a fantastic evening. :: What about the other restaurants on board, and how do they cater for babies? The quality of the food in the ship's four main restaurants, which each had at least two tasty vegetarian options on their standard menus, meant it was easy to eat like kings and queens, even without opting for the speciality dining option. On our first night, our waiters Arvin and Dujon (they moved with us as we rotated around the different restaurants during the four days on board), asked the chef to prepare purees for Evie's breakfast, lunch and dinner the next day, delivering them to wherever we wanted to dine. For breakfast, the buffet with table service offered by the Enchanted Garden was our favourite, while for lunch the buffet at Cabanas, offering everything from pizza or piles of mac 'n' cheese to jumbo shrimp cocktails and a carvery, was hard to beat. Disney is all about its stories, and nowhere does that come to life more than in the Animator's Palate restaurant – a real highlight of the whole cruise. Large screens around the restaurant act as windows looking out onto an animated underwater world, with Crush the lovable turtle from Finding Nemo ("a most-excellent ambassador of the oceans and seas") swimming by to entertain us as we eat. 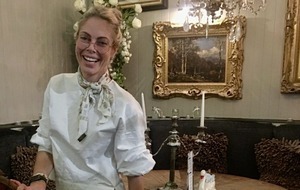 Gliding from window to window, between our courses of smoke salmon tartare and a trio of veal, Crush engages us by name in the manner of a stand-up comic, even reacting in real time to our answers or actions, much to everyone's delight – not least Evie, who beamed with glee. :: What's Disney's private island like? 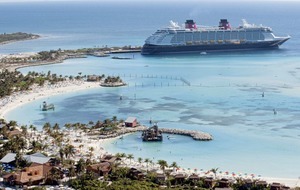 None of the fun and sparkle is lost when we step off the ship in the Bahamas, for a day on Disney's private island, Castaway Cay. After a splash in the turquoise waters and a play on the golden sands, we relax in hammocks under palm trees just yards from the water's edge, while Evie naps in the shade. Afterwards, we all explore the reefs surrounding the island in a glass bottom boat: tickets are US$44 (£31) for adults and children aged 10 and over, and US$33 (£23) for under-10s. :: And what happens during the day at sea? The next day, as we slowly cruise black to Florida, we make the most of the opportunity to explore the rest of the Disney Dream. It ends with us donning red and black bandanas, as Captain Jack Sparrow drops in for an impressive Pirate Night showdown with Captain Hook and his mateys. Everyone's encouraged to join in, with cast members dotted around the deck at several points so children and adults alike could follow the moves, before a dazzling array of fireworks lights up the ship and the night sky over the Atlantic. 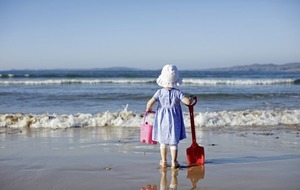 :: So what's the verdict – can you really take a baby on a cruise and have a good time? From a 6ft Mickey Mouse, to a dancing Donald Duck and more Disney princesses than you could ever wish to see, every moment on board was an incredible baby sensory experience in overdrive. Whether exploring the fountains of Nemo's Reef (a water play area for babies next to the main pool on deck 11), playing on the quiet deck in the shade of the lifeboats, or being mesmerised by a stunning performance of Beauty And The Beast, which saw the packed 1,340-capacity theatre transform into a floor-to-ceiling library, Evie was surrounded by bright, engaging and interactive experiences from morning 'til night. She may have been too young to understand or appreciate Disney – and it's quite possible my wife and I enjoyed meeting Mickey, Minnie and Donald more than Evie did – but there's no doubt the unforgettable sights, sounds and sensations were bigger and better than anything she has experienced before. And with every detail taken care of, we had a magical time too! 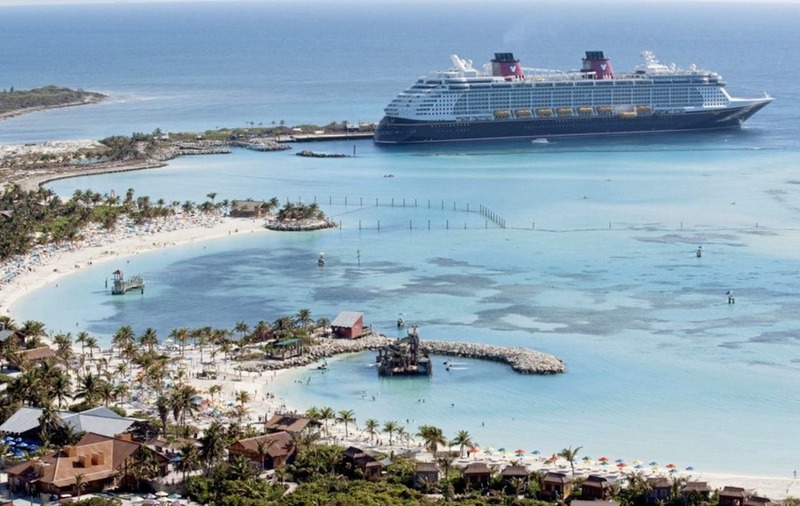 Wesley Johnson travelled on a Disney Cruise Line Holiday with Virgin Holidays Cruises, who offer a four-night cruise on board the Disney Dream, departing from Port Canaveral and calling at Nassau (Bahamas) and Disney's Castaway Cay, from £799pp. Price based on two adults travelling and sharing an inside Stateroom cabin on a full-board basis, departure August 27, 2018. Offer is subject to availability and includes all applicable taxes and fuel surcharges which are subject to change. To book, visit virginholidayscruises.co.uk, call 0844 488 3084 or visit one of their 126 stores located in Debenhams and House of Fraser stores nationwide.